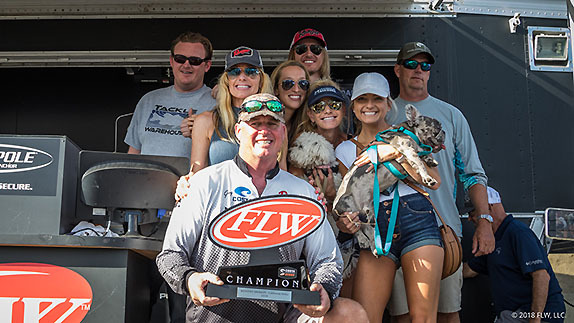 Gregory Troughton caught two of the three bags weighing more than 20 pounds at the California Delta Western FLW Series. Gregory Troughton has had a big year competing in tournaments across various circuits at the California Delta. He carried that momentum into his FLW Series debut, and it's still rolling. The 55-year-old resident of Discovery Bay jackpotted the final Western Division event of 2018 and walked away with top honors. He outdueled Delta studs such as Bobby Barrack (2nd), Ish Monroe (3rd) and Ken Mah (4th) to claim the 1st-place prize package valued at more than $77,000. He said that haul pushed his winnings from his home body of water over the past 11 months into six figures. "The last 4 to 5 years I've really improved," he said. "I've spent a fortune on equipment, and it helps. I did all the (preparation) work, I had the right gear and everything came together." His 60-02 total for 3 days outdistanced Barrack by more than 6 1/2 pounds. He caught sacks weighing well in excess of 20 pounds over the first 2 days, then closed out the triumph with a bag about half the size of his previous two after strong winds had blown apart the vegetation mats he'd been exploiting. Troughton, a key account manager for Henkel (a global chemical and consumer goods corporation), played football at the University of California for 2 years in the early 1980s, but even at that stage of his life he'd already been bitten by the tournament fishing bug. His career on the gridiron (he played one season as a tight end and one as a linebacker for the Golden Bears) ended after he broke the same bone in his foot on three different occasions. He was at Cal on a full athletic scholarship, but he had two brothers attending the school at the same time as tuition-paying students. His father promised he'd help him purchase a boat if he could graduate in 4 years (while the scholarship was still in effect). He started fishing tournaments in the fall of 1987, right about the time his first son was born. The second son came along a couple years later and competitive fishing, although he still dabbled in it, played second fiddle to family life for the better part of two decades. 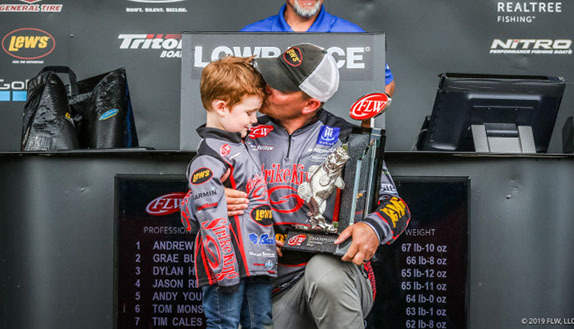 He bought his first "real bass boat" in 2010 when his oldest son completed college and has competed in dozens of tournaments every year since. He developed a mat-punching program by following the lead of Delta stalwart Bub Tosh, the owner of Paycheck Baits. He said his physical stature (6-foot-5 and 250 pounds) makes him ideally suited for the technique. "My size gives me great leverage and it is 'the deal," he said. 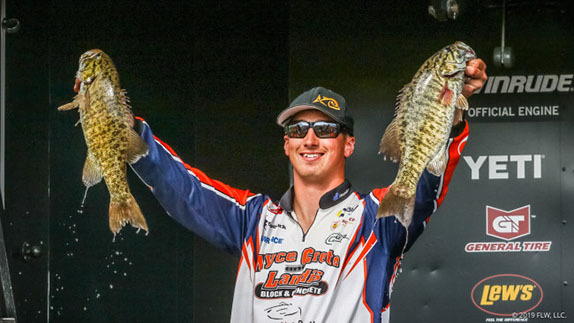 "It's the way to win tournaments, not only here, but on Clear Lake, too. I've worked hard to make sure I was good at it. "I've got three punch rods on my deck all the time with different weights and set-ups. I've caught 20 fish over 10 pounds and it can be done in tournaments, too, even with all the pressure." Troughton punched out sacks weighing 22-07 and 24-14 on the first 2 days to lead by nearly 10 pounds as the field was cut to the top 10 for the final day. 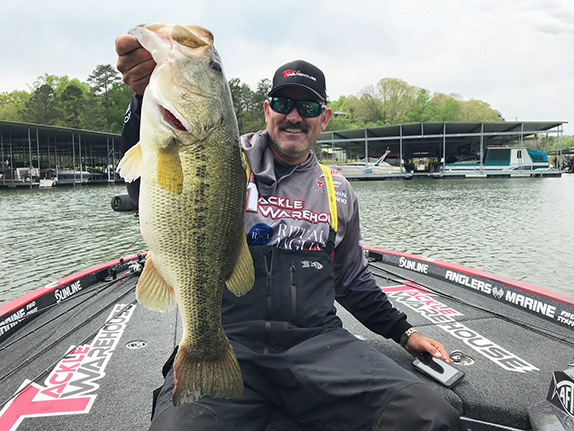 There was only one other stringer exceeding 20 pounds weighed during the event � 22-11 by 5th-place finisher Jerred Jennings on day 2. His second-day bag was topped by a 9 1/4-pound bruiser and also contained a 7. Like most of the others he took to the scale, they came from peat clumps below the mats in 6 to 8 feet of water. "I'd punch through there and let the bait wiggle around and (the fish would) just sort of mouth it," he said. "I'd lift up to see if I could feel anything and if I felt something weird, I'd jack it. It was usually a fish and some of them were big." With most of his mats dispersed by the wind (that phenomenon began to take shape toward the end of day 2, after he already had his weight), the final day was a bit of a scramble. He arrived at his preferred starting location to find three goose hunters in a blind (it was the opening day of the season) with a bunch of decoys spread out in front. "There wasn't anything flying, so I asked if they minded if I fished around there and they said to go for it. I threw a popper around and caught three, then I pulled out a wacky-rigged Senko and caught my fourth." He then moved on to stretches near Mildred and Little Mandeville islands. At the latter he encountered a huge sea lion thrashing the water in a quest for a meal. "I tried to beat him to this one little spot, but I couldn't do it," he said. "He went right to it." He felt fairly secure after he'd picked up a couple more fish in the 3-pound class. "I knew I had close to 12 pounds and that meant the guy in 2nd would need 18 on a tough day. I'd seen many times how tough that third day can be and how much the weights decline. I felt really confident." > Punching gear: 8' heavy-action Powell 806 rod, Shimano Core 100 MGFV casting reel (out of production), 65- or 80-pound Stren Sonic Braid (out of production), 1, 1 1/4 or 1 1/2-ounce tungsten weight, Paycheck Baits Punch Skirt (the general), 4/0 Gamakatsu Super Heavy Cover hook, Yamamoto Flappin' Hog (green-pumpkin/red flake). > His final-day bait lineup also included a Don Iovino's Splash-It popper, a half-ounce Z-Man/Evergreen Jack Hammer bladed jig with a Yamamoto Zako trailer and the wacky-rigged Senko (green-pumpkin). > Main factor in his success � "I stayed out of my primary water for 3 weeks � I never went in there. I knew I had a chance to win this tournament if I did that. (Delta veteran and 12th-place finisher) Harvey Pulliam fishes in there a lot as well and he gave me a lot of respect; he didn't come out and jump all over the stuff I was fishing. He was totally professional." > Performance edge � "The Ranger 520c I bought 2 years ago is like fishing out of a Rolls-Royce. It's so stable and the storage and the organization are incredible and it rides extremely nice. The guys at C&C Marine in Modesto take such great care of me. When you know everything with your boat is great, it frees you up to just fish."